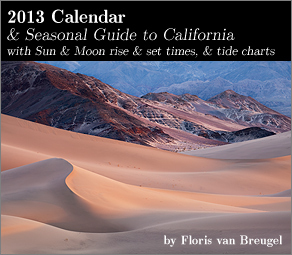 I am very pleased to offer two calendars featuring my photography for 2013. In addition to seasonally appropriate images, I have included graphs to show the sun and moon rise/set times, as well as tide charts and other seasonally relevant information. You can choose either a Washington or California edition. See below for more information. Trouble ordering? Contact me. Pre-order Pricing - get $3 off until Oct 21st! What makes these calendars special? Well, for one, they feature twelve of my images at 11x16.5 inches - for under $20! Furthermore, since I custom designed the calendar from scratch, I took a unique approach and included intuitive graphics that show the Sun and Moon rise/set times for every single day, in addition to the predicted tides. Indeed, these are location specific values, but they do not vary by that much throughout each state. For example, in California (relative to Monterey) Sun and Moon rise/set times do not vary by more than 20-30 minutes, and high/low tide timings for the northern and southern parts of the state vary by no more than an hour, so they still provide a very useful guide. The variation is even less for Washington. And that's not all. For every month I have included a small description of what natural phenomena are happening around the state, such as typical bloom times for wildflowers, when fall colors start to appear, or when the first snow generally starts falling. 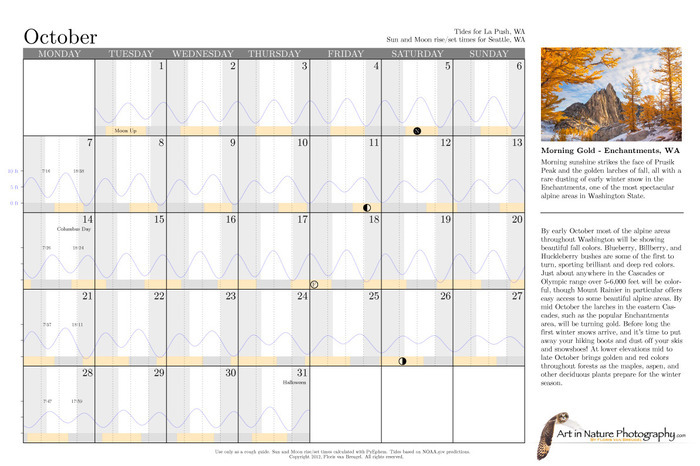 Each month includes an 11x16.5in print, with this calendar layout below. Sun and Moon rise and set times, along with tide charts, are given for each day. Also included is a brief description of seasonal information. 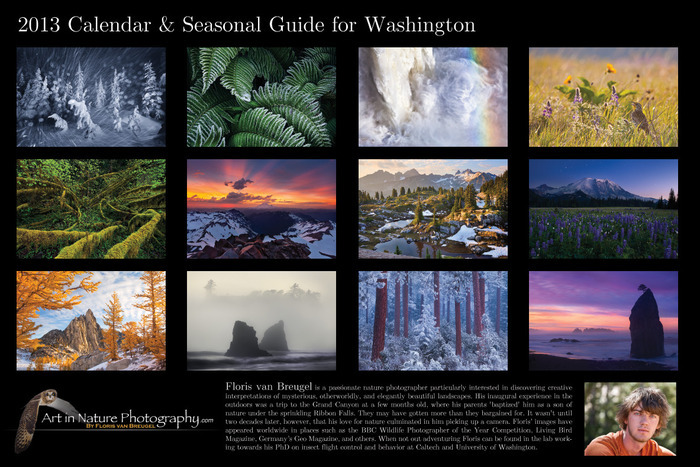 Back cover of the Washington calendar, showing the selection of images. 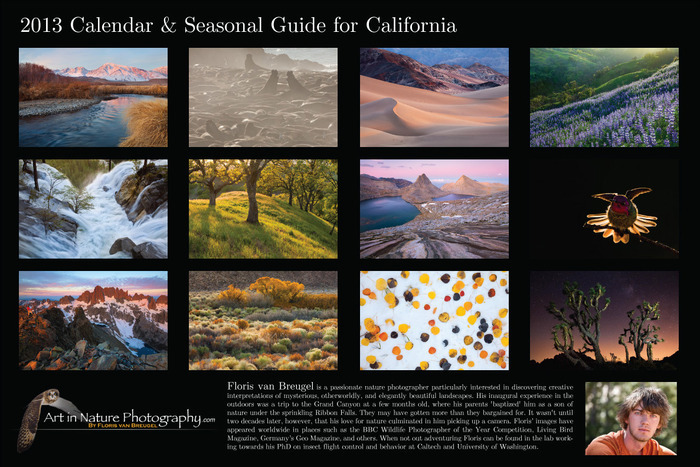 Back cover of the California calendar, showing the selection of images. In addition to the calendars available for purchase above, you can download free Sun/Moon/Tide calendars for selected cities. Just click a city name below to download the pdf. If there is a city/tide station that you do not see listed that you would like to have added, please contact me and I will see what I can do. 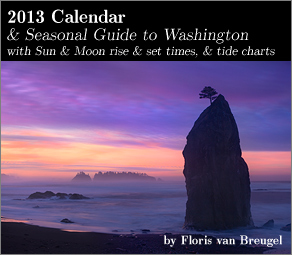 If you are interested in licensing such calendars for commercial use, please contact me.